I am so freaking excited to be in my first ever gallery show, I feel like a real artist. Also there are some insanely awesome and talented people involved and my stuff gets to hang out near their stuff and be friends. Maybe our toys will have slumber parties. 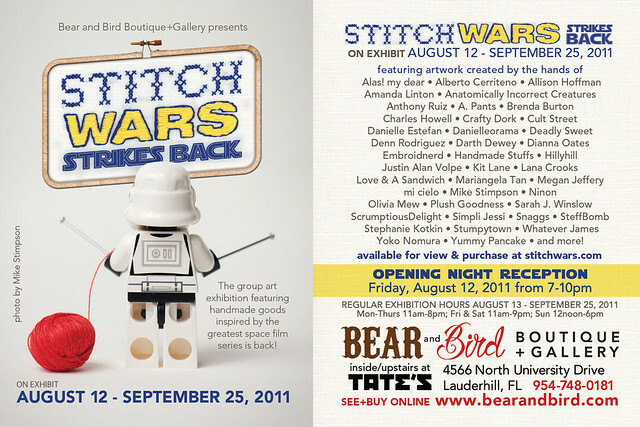 Stitch Wars opening night was this past Friday, August 12th. I really wish I could have made it, but Florida is a bit of a drive and as supportive as Bats is I don't think he would have been down for a twelve hour trip. What a loser. I'll just have to enjoy it through the magic of the internet. 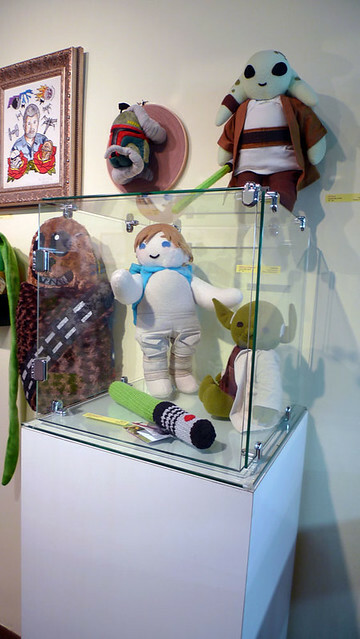 I made three dolls for the show, a Kit Fisto and a Yoda and Luke on Dagobah. 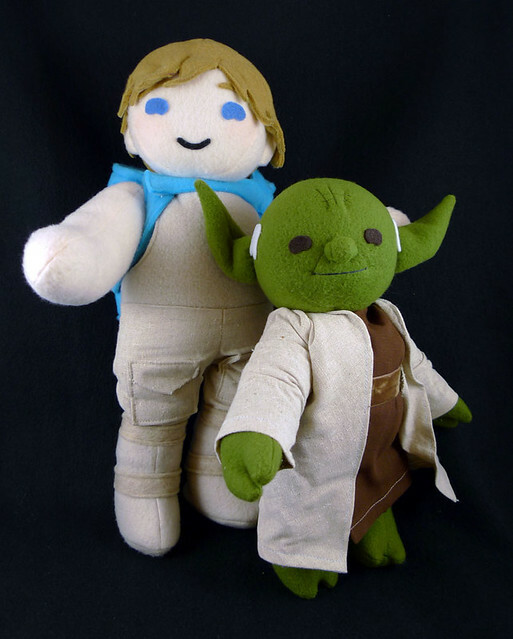 I had to make Luke a little bigger than the usual dolls so Yoda wouldn't have to be so tiny. Luke is about 21" tall compared to my usual size of 17". I found this really really great rough muslin for Luke's pants and Yoda's robe. That makes me happy, which is how you know I'm a big fabric nerd on top of being a big Star Wars nerd. I am like a totem pole of nerdosity. 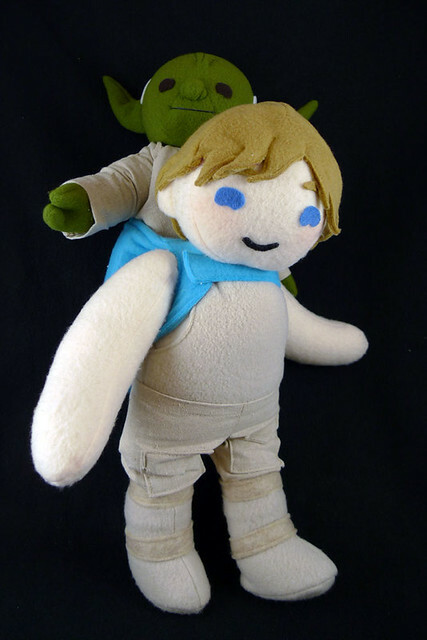 Luke has a little backpack so Yoda can ride along and make cryptic and generally unhelpful comments. The pack attaches across the front with velcro so it can also be removed as well. The original Kit I did as a commission was so popular﻿ and came out so well I had to make another one for this show. He has some small changes; a different robe and spotty tentacles. 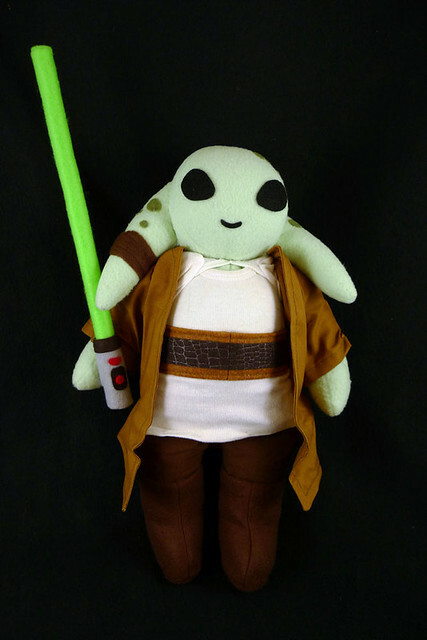 The head is jointed and the lightsaber attaches to his hand with velcro. Added bonus, his lightsaber is fun to hit people with. Also, I'm making a million more Kit Fistos because they are so freaking cute I'm going to explode. The show runs through September 25th. Check out photos of all the artwork on Bear and Bird Boutique's Flickr stream or at their website. If you're interested in purchasing, there's a price list and availibilty sheet on the website here. 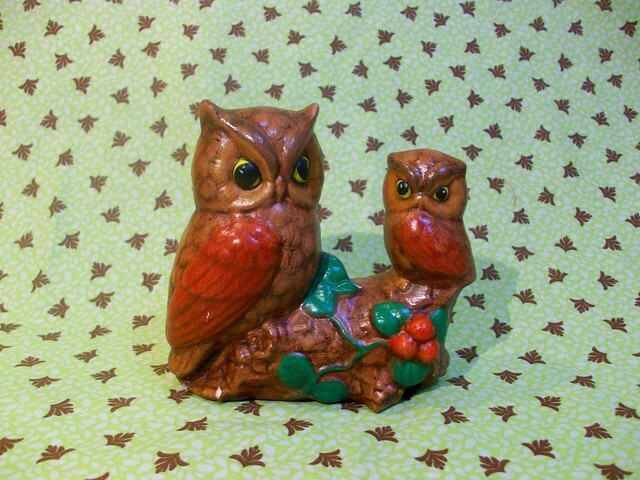 This week's Nifty Thrifty is dedicated to thrifted versions of one of my favorite animals, owls! 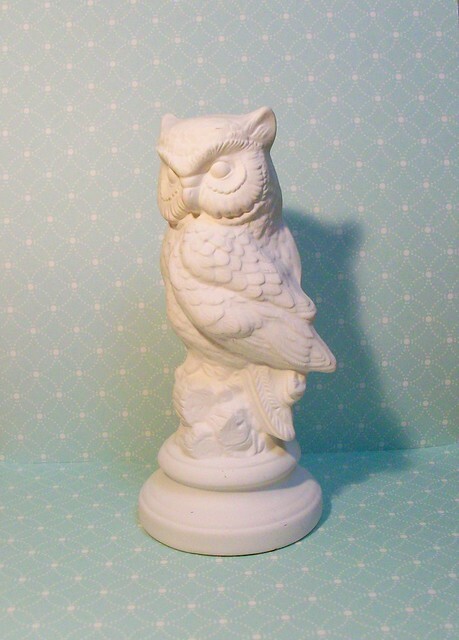 I've always loved owls and I'm so happy that they're so popular. 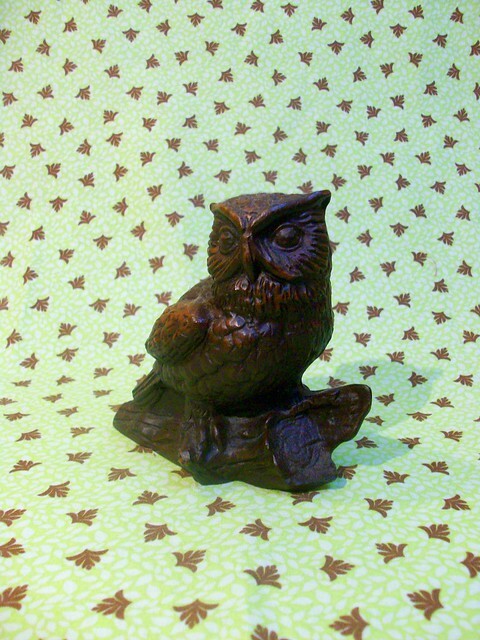 (Actually, are owls still popular or have we moved onto unicorns or squids or chupacabras now?) They're incredibly interesting and occassionally hilarious birds and I can't help but be amazed when I see one glide silently through the tress. There are several owls in our neighborhood, although we tend to hear them much more frequently than we see them. One of them has the funniest hoot, he always sounds so excited. I assume this is meant to be painted as there's no finish on it. I like it plain white though. I think both of these would look cute painted a bright, solid color. 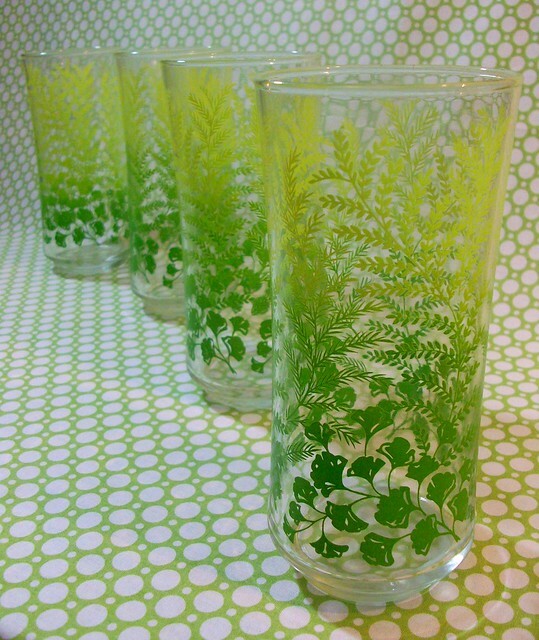 A can of spray paint in a current color is a great way to update thrifted finds, and can also cover up any small imperfections. I am personally on the hunt for a large ceramic rhino to paint an obnoxious color. You have to have a dream, right? I love this little pair, although they look super angry. 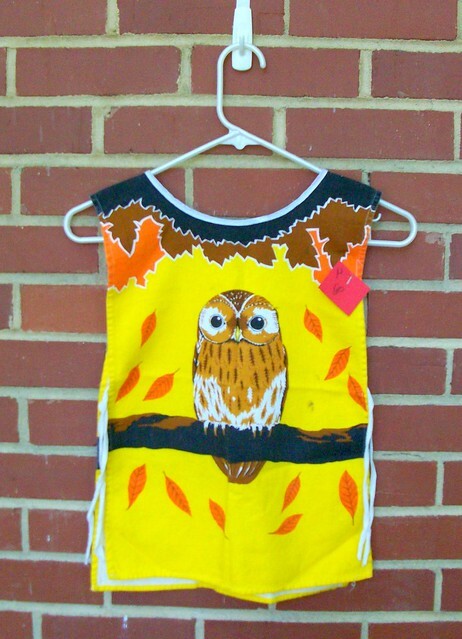 I also found this cute little childrens smock at the thrift store. It had some stains near the bottom, so I turned it into two little owl patches with some iron on fusible web. 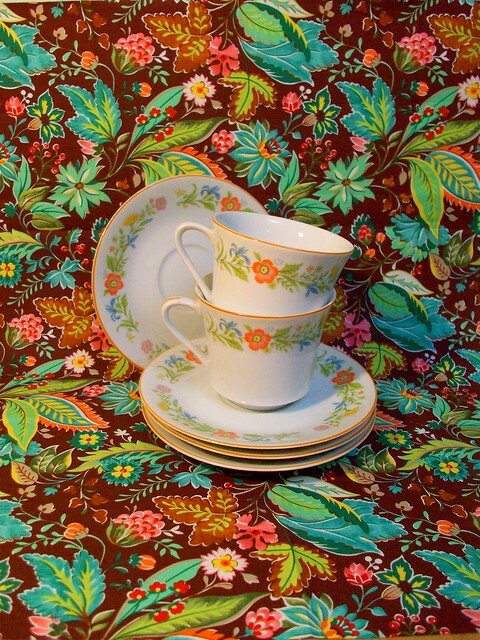 If you're looking for home decor besides sheets and curtains, thrift stores are also lousy with assorted tableware and kitchenware. Look no farther than the thrift store for a cheap way to get a lovely table setting or add some kitschy charm to the kitchen. I love the look of mismatched place settings using plates that are similar in color or tone. Check out these gorgeous thrifted vintage table settings at Once Wed and Edyta Photography. 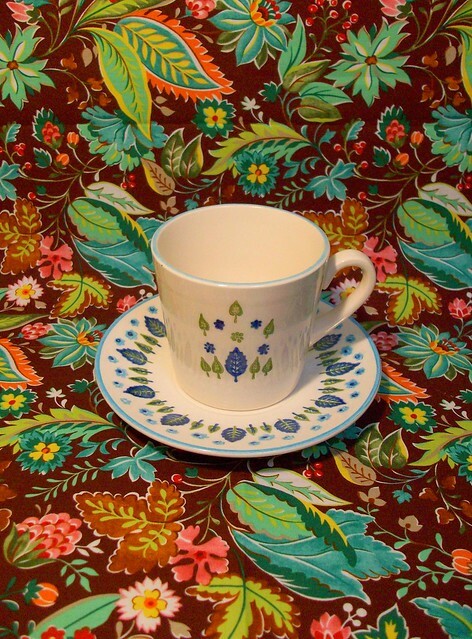 There are also some lovely vintage tableware at this post on Want. 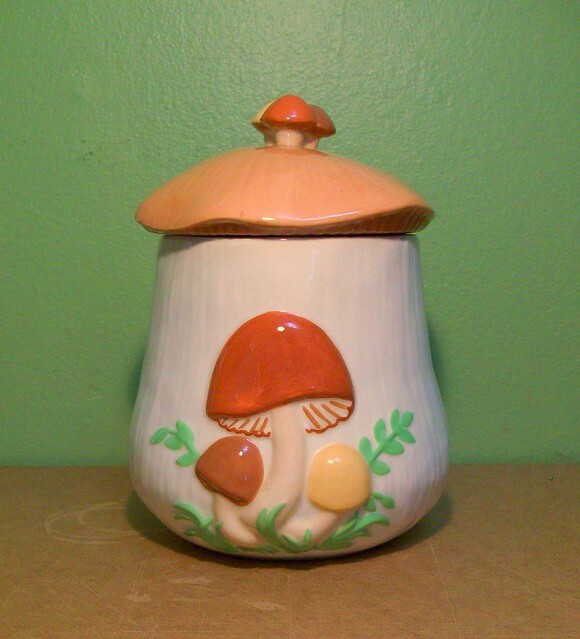 Here are some cute finds I've gotten at the local thrift shop. 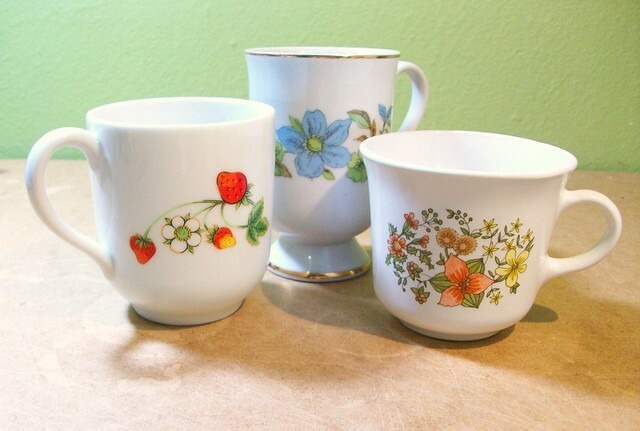 You can turn sweet china cups like this into equally adorable pincushions. Measure the diamater of the cup and cut a cirlce of fabric with a diameter twice as long. (So if you're cup measures 4 inches across, cut an 8 inch wide circle of fabric. Run a gathering stitch around the edge of the fabric and pull to gather. Stuff firmly before pulling the thread as tight as possible and tying off. Glue in place with hot glue or fabric glue and trim in desired. 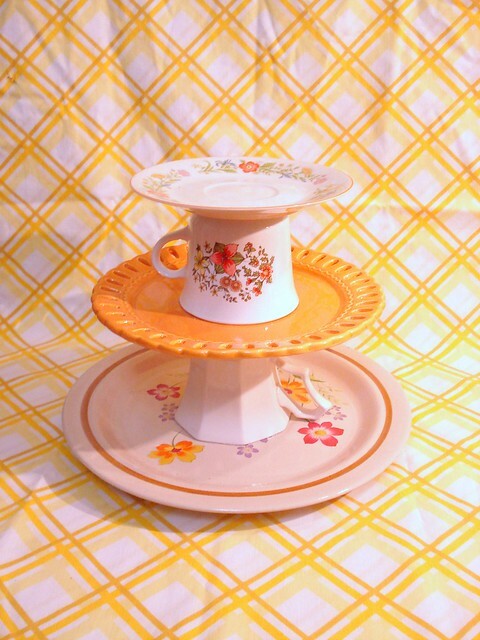 You can also combine plates, cups, and other tableware to make lovely tiered serving trays or cake stands. Use it as the centerpiece of the table covered with candies, baked treats, or flowers. I've also used it as a way to store jewelry that is pretty and easily accessible. I used three dishes and two cups to make this, but you can use any combination you like. Use one cup or short candlestick with a pretty plate for a cake stand, or use two plates and one cup for a shorter tiered display. To do, first decide how you would like your items arranged. Once you have a set up you like, wash and dry the plates throroughly. Try to avoid touching the plates or cups where they will be glued to avoid getting any oils from your fingers on them. Use a strong waterproof glue like E-6000 to attach them. Apply it to the edges of the cups, making sure to apply a generous amount to avoid any gaps between the plate and cup where water could seep in. View from multiple angles or measure from the edge of the plate to the cup to ensure that the cup is centered. Use a cotton swab to wipe away any excess glue. Once you have it all assembled, place a heavy book on top and leave it to set until the glue is cured. Sometimes I get sad because I make something as a custom and I don't want to send it away. 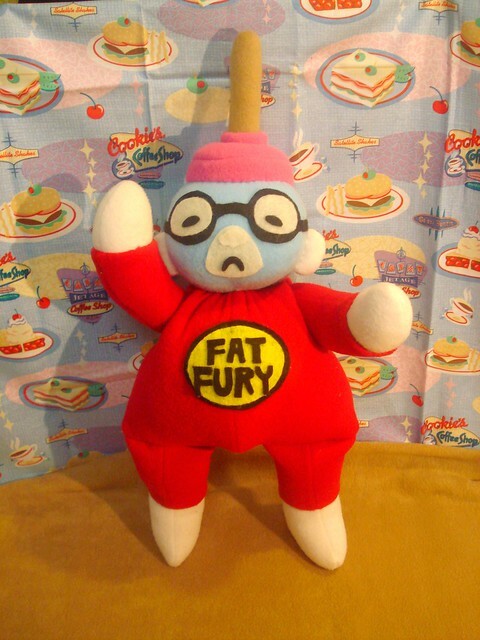 Then I remember I can make as many dolls as I want for myself. Did that just make you sad? It's okay, I know what will cheer you up. Don't you feel better now? Seriously, look at his little face! I love making dolls with ears that stick out. 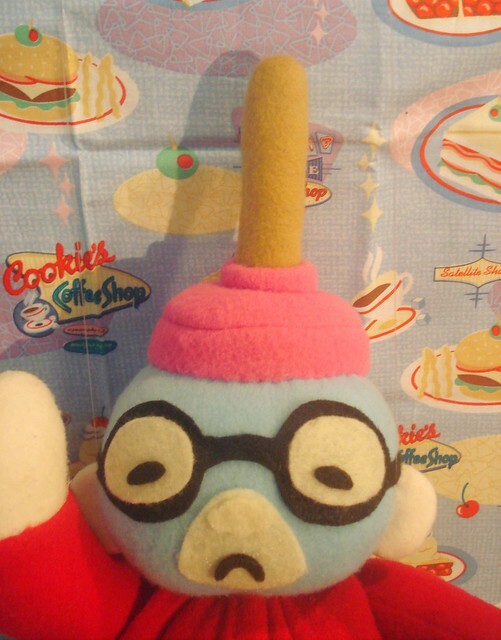 It probably says nothing good about me that I had way too much fun making a teeny plush plunger. I also found myself wishing I had a little plush toilet to unclog. Oh wait, I found one. Thank you, Internet. With Jake the dog and Finn the human, the fun will never end. Adventure Time! 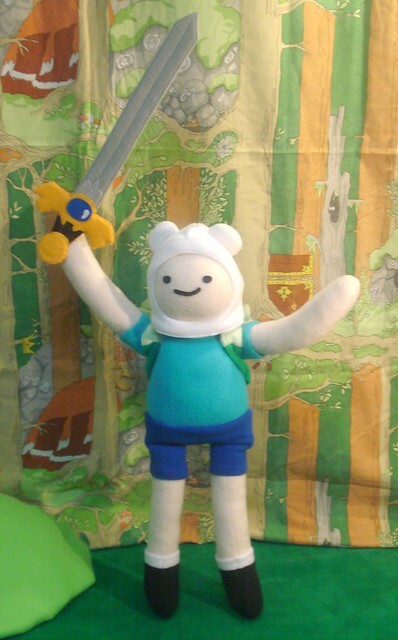 Finn and Jake are custom orders. 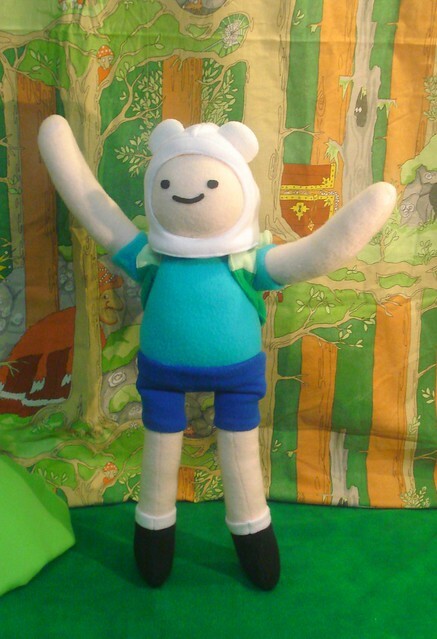 Finn has jointed arms, a pack that opens, and a removable hat. There is Velcro on his hand so he can hold his mathmatical sword. He stands about 22" tall. Jake has elastic in his arms and legs since it's hard to give plushes magical stretching powers. Hey, I'm good, but I'm not that good. Also, this! With Neil Patrick Harris and the awesome daughter from Californication. I am now required to make a Fionna costume. Which is totally upsetting news for me, I have to say. Seriously, I cried.